With snow on the ground and well-below-freezing temperatures, I'm feeling far from summery. Warmth was my priority today, so I layered a sweater and cardi. I enjoy dressing for cold weather, but I can't wait for the new wardrobe possibilities of spring. 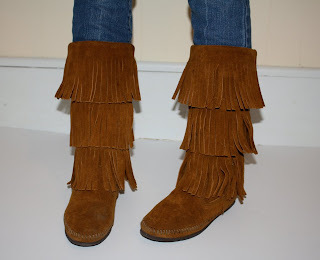 Though I'm not thrilled about the outfit, I'm super excited about my new fringe boots. The last thing I need to buy is more shoes, but I've been eyeing them all winter and got them for half price. They'll look really cute with skirts and dresses this spring. And though fringed boots are trendy right now, I think I'll put these to use for years and years to come.